Random House. Hardcover. GOOD. Spine creases, wear to binding and pages from reading. May contain limited notes, underlining or highlighting that does affect the text. Possible ex library copy, thatâll have the markings and stickers associated from the library. Accessories such as CD, codes, toys, may not be included. Random House, 1977-06-12. Hardcover. Good. Good hardcover in dust jacket and plastic cover. Dust jacket shows light edge wear. Ex-Library (college) with usual markings. Text is clean and unmarked. Binding is tight, hinges strong. ; 100% Satisfaction Guaranteed! Ships same or next business day! New York, NY, U.S.A.: Random House, 1977. Hardcover, Very Good text in a Good dustjacket with edgewear, small tears and price label. Collection of 8 science fiction stories by authors James Blish, Jack Vance, Brian W. Aldiss, J.G. Ballard, R.A. Lafferty, John W. Campbell, Cordwainer Smith and Robert Silverberg.. ISBN: 0394494792. Hard Cover. Very Good/Good. SCIENCE FICTION AMERICAN ENGLISH SHORT STORIES. New York: Random House. Good with no dust jacket; Used - Ex-Library with Markings. 1977. First Edition. Hardbound. 0394494792 . Science Fiction as Visionary Literature; 276 pages . Random House, 1977-06-12. Hardcover. Good. Random House. Hardcover. 0394494792 FIRST PRINTING. DJ IS WHOLE WITH GOOD COLOR AND MINIMAL FLAWS AND IS CLIPPED. NO NAMES OR MARKS SEEN ON TEXT PAGES. NOT EX-LIBRARY OR REMAINDER-MARKED. APPEARS UNREAD. SEE PHOTO IF AVAILABLE. We ship faster than lightning on a golf course? Maybe, but an Informed Buyer is our Best Customer. You can ask us any question. Packed Carefully and Shipped Promptly by Highly Rated and Experienced Seller on Amazon since 2006. 5240 LB 01. . Very Good. NY: Random House. Very Good in Fine dust jacket. 1977. Hardcover. 0394494792 . 275 pages; Very Good /Fine. First Edition not stated. Outside page edges lightly age tanned. Inside boards has glue bleed through on end papers and small stain bottom corner inside front board. Boards are straight, tips are pointed, spine is square and pages are clean. DJ is Great. Other authors include James Blish; Jack Vance; Brian W. Aldiss; J. G. Ballard; R. A. Lafferty; John W. Campbell and Cordwainer Smith. Great reading! . New York, NY: Random House, 1977. First edition (stated) / first printing (9 8 7 6 5 4 3 2). Book is in fine condition with a near fine (spine lightly sunned) unclipped dustjacket protected in a Brodart wrapper. An Attractive Copy! Please feel free to ask me for pictures or more information, Thanks. . First Edition. Hard Cover. Fine/Very Good. New York: Random House Inc, 1977. Book. Fine. Hardcover. 1st Edition. A square solid tight un-read and possibly un-opened copy. The reverse of the jacket has some soil caused by rubbing. Book features short fiction by James Blish,Jack Vance,Brian W. Aldiss,J.G. Ballard and others. Very nice copy of a 30 year old book..
New York: Random, 1977. Hardcover. Fine/Very Good. First edition. Fine in very good dustwrapper. Dustwrapper rubbed minor tearing. Please Note: This book has been transferred to Between the Covers from another database and might not be described to our usual standards. Please inquire for more detailed condition information. New York: Random House, 1977. Hardcover. Hardcover with dustjacket. 8vo. First edition. Review slip laid in. Book is in fine condition. Jacket is in VG+ condition; there is a tiny ding to top edge, and one lightly bumped corner. Not price-clipped. 275 pp. New York: Random House, 1977. 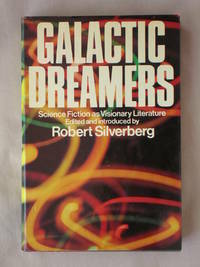 Signed by Robert Silverberg on title page - signature only. Book in Mylar cover. Minor speckling noted on edges - tight and crisp. First Edition, First Printing. No remainder marks, no ink markings. NOT priced clipped. In well packed Boxes - no padded envelopes. Signed by Author. First Edition. Hard Cover. Near Fine/Near Fine. Random House, 1977-06-12. Hardcover. Used:Good. 1977-06-12. Good. Ships with Tracking Number! INTERNATIONAL WORLDWIDE Shipping available. May not contain Access Codes or Supplements. May be ex-library. Shipping & Handling by region. Buy with confidence, excellent customer service! We're sorry - this copy is no longer available.